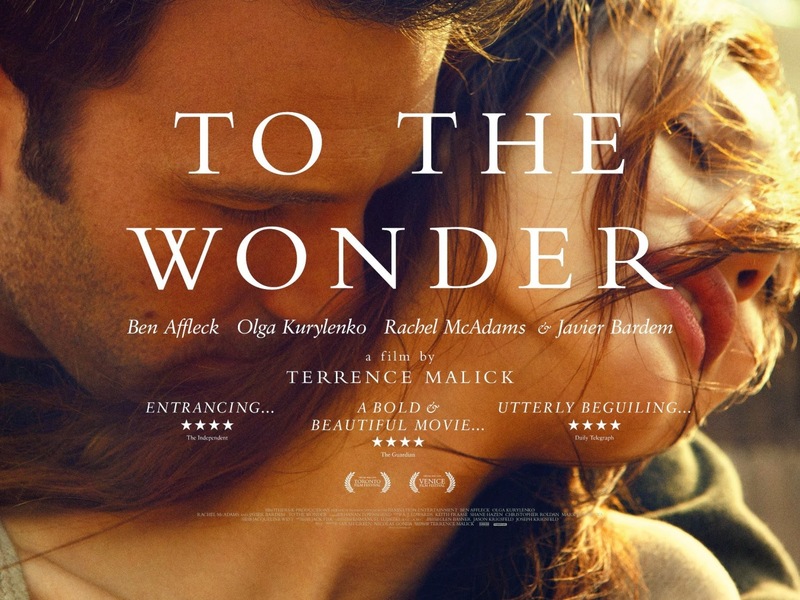 Fair warning: To The Wonder is a film about love, and as such this write-up is full of senseless babble on the subject. Proceed at your own risk. "Love makes us one. Two... one." Love brings people together, it makes two separate beings into one; but what happens when each of those people is already split in two to begin with? The conflict within the thesis that love unites us is that human beings are constructively separated from themselves, they are all singular people each with two separate sets of instincts and desires. To The Wonder asks exactly this question of how two people can come together as one if they are themselves already more than one person. Does "love unite us" in the sense that it brings different people together, or in the sense that it makes singular, emotionally divided people whole? How can we love (come together with) another if we don't love (aren't one with) ourselves? To The Wonder shows us four people, all with fundamental divisions in their character. The most explicit instance of the characters' internal psychological divide comes from Marina (Olga Kurylenko): "I find two women inside of me. One full of love for you. The other pulls me down towards the earth." Similarly, both Neil (Ben Affleck) and Father Quintana (Javier Bardem) are constructed as incomplete in the way they're both detached from their emotions ("I know that strong feelings make you uneasy"; "Let me not pretend. Pretend to feelings I don't have."). Neil even finds his divided nature embodied in his career as a fracking consultant. His job literally involves splitting open the earth, dividing nature. Jane (Rachel McAdams) was separated from herself by the death of her child, the death of that which was once part of her but is now separate. These themes are built around the basic narrative structure of a love triangle. Marina and Neil are living together, but they have a fight and split up, at which point Jane enters the picture. Each character believes they can heal their psychological wounds, their broken beings, by uniting with someone else. But this just leads to more discord. Two sets of halves don't make a single whole. We must first learn to love ourselves ("Love that loves us"), to unite the two halves of our own being before we can help others do the same. This is why Marina has to leave Neil in the end: they have to learn to be alone before they can learn to be together. This story is composed as a series of brief fragments, as if there was once a much longer version which was cut down into its most intense moments. The story is chopped up without leaving the normal coordinates of a narrative intact, creating a purposefully patchy and disjointed tale. This allows the thematic content to take center stage, but it also presents a unique version of reality, as if the half-remembered shards of our memories are all we have left to live by. And not only is the plot broken up, even the editing style is jumpy. These structural elements present To The Wonder as an incomplete story of incomplete people. Malick subverts the romantic fantasy that others can "complete" us by showing how we must first complete ourselves. "Where was it that we were together?"